Academic Zahid Khalilov was the founder of the school of functional analysis. More than 40 years of his life he devoted to rational pedagogical and science activity. Academic Zahid Khalilov was the head of department of theoretical mechanics. 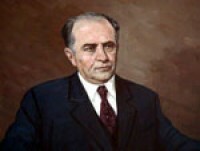 From 1955, he worked at several responsible positions of Academy of Science ; he was an academic secretary of the department of physics, techniques and mathematics, vice president and in 1962-1967 president of National Academy of Science of Azerbaijan . From 1967 to the end of his life he was the rector of Institute of Mechanics and Mathematics of NASA. His scientific activity consist of functional analysis, various problems in the sphere of differentiate and integral equation, and applied problems of concrete matters of mechanics and etc. Academic Zahid Khalilov was awarded the name honored scientist and technical work, 2 orders of Red Work Flag, order of Glory Symbol and several other medals of former USSR. At present, the street where the Baku State University is situated is named after Zahid Khalilov.